Marrakech is one of the most exciting cities in Morocco, with its bustling medina (old city) and huge central square where vibrant culinary and cultural events are always taking place. With over 1,000 years of human history running through the city walls, the ancient city of Marrakech mixes age-old traditions with modernity, to create a curious contrast unique to Morocco. Since Marrakech is such a happening place, it is important that you see the essential sights and avoid the many tourist traps around the city - and trust me, there are a LOT of traps. The must-sees include eating dinner at the night market in Jemaa el Fna square, getting lost for hours in the souks (the market place), drinking Moroccan mint tea on a rooftop at sunset, and visiting the humble photography museum hidden in Marrakech's old city. The definite don'ts include taking photos with exploited exotic animals in the historic center, getting pulled into various unwanted tours or shops, and drinking the tap water. 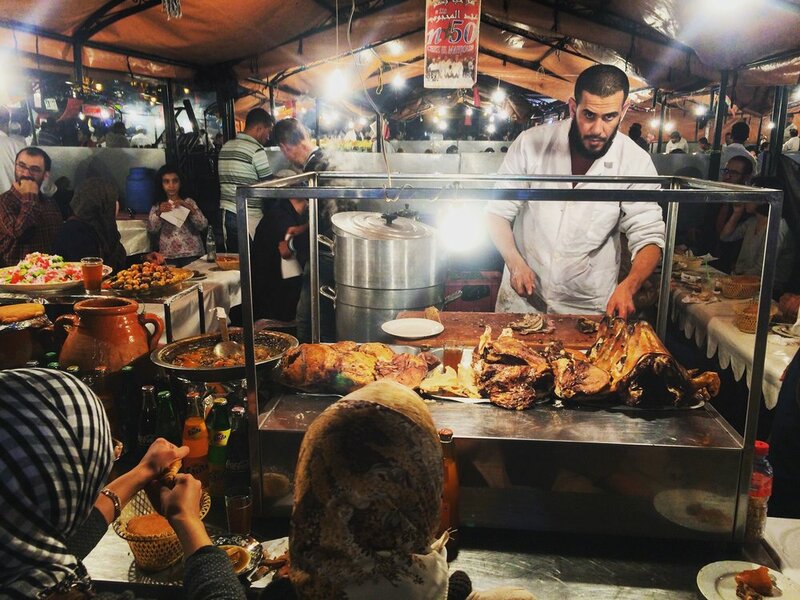 For excellent authentic Moroccan food and the best deal for your buck, go to the night market in Jemaa el Fna Square! It is packed with mouthwatering food stalls that cook up meals right in front of your eyes. The food here is totally safe to eat as long as you go to an official stall. I recommend eating at the "world famous" Stall #1; everyone in the streets told us to go here. When we first approached Stall #1, I was skeptical that it might be a tourist spot with over priced and mediocre food, but when we showed up a film crew was there filming a piece for a travel series on Morocco. I spent $3 USD and got a plate of hummus, moroccan salad, bread, and kebab. It was delicious! Marrakech can be overwhelming at first, especially in the souks, within minutes you can find yourself lost deep in the marketplace (I certainly did). But fear not! Embrace the chance to explore the twisting and turning ancient streets of the souks that tell the story of a thousand years of urban development in Marrakech, a city at the western edge of the Islamic world. The souks of Marrakech are a highlight and are hard to miss, with scents, sounds and sights changing with each new alley you explore. There are plenty of souvenirs to pick up here – some for a bargain and some of questionable quality. The Maison de la Photographie of Marrakech is a private foundation created by Hamid Mergani and Patrick Manac’h in 2009 in order to exhibit the exceptional diversity of Morocco as it was seen by those who visited it from 1870 to 1960 - both anonymous and famous photographers. If you are interested in photography and history of the Moroccan people, definitely visit this museum. Although it can be difficult to find in the medina, this museum is situated inside a beautifully refurbished traditional riad (a Moroccan house with a garden, ideally divided into quarters with a central fountain). You will have to get past the popular souks and walk through some twisting back alleys to find the hidden riad where the museum is set, but even if you get lost on your way, the museum is well worth the hunt. Buying one ticket for 40 MAD ($4.08 USD) gets you unlimited access. Plus, the rooftop terrace in the museum has one of the best views of Marrakech overlooking the surrounding buildings. This is my ULTIMATE pet peeve when it comes to tourism. During the day Jamaa el Fna Square is mostly occupied by orange juice stalls, water sellers with traditional leather water-bags, and people with chained Barbary apes and snake charmers who will try to sell you a picture - despite the protected status of these species under Moroccan law. Paying money to see these animals is illegal and abusive. Captivity only further promotes the privatization of nature and wildlife in our modern world. When you visit a new place, it is important to be respectful of a country - this includes the wildlife. If you want to see a monkey or a snake, then I recommend going for a hike outside of the city where you can see them in the wild or contacting wildlife organization working to protect these animals to learn more about them and where to see them. To learn more about how you can protect animals as a tourist, visit this article about ending wild animal abuse for entertainment. 2. Don't get reeled into unsolicited tours with unoffical guides. Avoid unsolicited tours by unofficial guides or ventures into people's shops. In the busy main streets of the medina (old city), you’re sure to be bombarded with the aggressive sales tactics of would-be guides and craft-sellers. These unofficial guides can be very persuasive and persistent, so be careful. Usually, an unofficial guide will approach you in a very friendly manner by asking questions about you and your trip. If you continue to engage with unofficial guides they will often try to give you directions to where you are headed or direct you away from where you're headed to another site. Tourists beware: although these unsolicited guides will offer to help you reach your final destination, once you get there they will likely demand a payment of 20 to 50 DH (2 to 5 euros) for their trouble. If an unofficial guide approaches you, simply respond to their questions in a friendly manner, but be firm about not wanting their services. If they continue to hassle you, simply continue on to your destination. 3. Don't drink the tap water (unless you're a local)! The drinking water in Marrakech is filtered and safe to drink although visitors usually decide to stick with the bottled water that is readily available and affordable. The locals regularly drink the tap water, but visiting tourists will not have time to adjust to it and are probably off drinking bottled water just to be safe. Mineral water can be easily purchased from the many kiosks and stalls around the Medina.